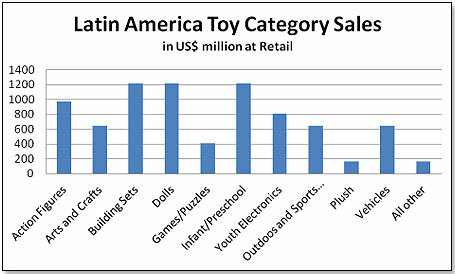 Marketing executives often look upon the Latin American toy market – comprising of all of South America, Central America and Mexico – as small potatoes when compared to North America and Europe, and it tends to be neglected as a result. This is a real error in judgment because the Latin American toy market today represents the best combination of market potential on one hand and ease of entry, in terms of cultural and linguistic affinity, on the other. 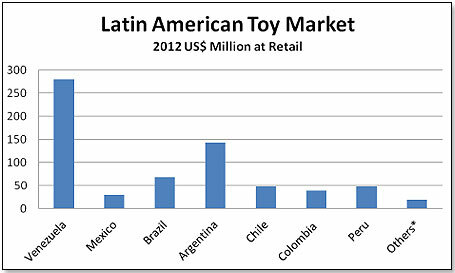 Latin America represented last year about 9.2% of the worldwide toy market, and 9.5% this year. Mattel’s annual report shows that the region had 14.4% of their worldwide total sales last year, whereas Hasbro’s number was 7.8%. Both have their own operations in Latin America – management, sales forces, and warehousing. In this analysis, I have relied a lot on published databases (NPD, TIE, United Nations, World Bank, etc.) but the most recent insights came in fact from two executives. One is Hector Maggi, owner of MarcasInteligentes.com, who is the sales agent for a number of important toy companies – Little Tikes, VTech, Playmobil, Funrise, Graco and others – located in Lima, Peru, and covering most of Latin America for these manufacturers. The other is Gabriel Bustamante, senior executive at the fantastically successful 2tor Inc, a provider of educational online programs. I also spoke to executives at Carrefour, Wal-Mart, Mattel and Hasbro. 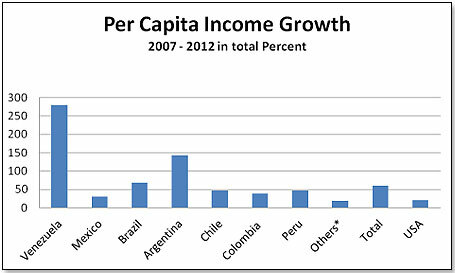 Their Latin American sales numbers have not been published but are estimated to have amounted to US$ 50 billion in 2011. It is thought that their toy market share in the countries in which they operate is now between 25% and 30%. Cencosud S.A. has operations in Argentina, Brazil, Chile, Colombia and Peru - 726 supermarkets, 81 home-improvement stores, 74 department stores and 25 shopping malls. Sales in 2012 amounted to US$ 14.9 billion. In Brazil, Cencosud stole a march on Wal-Mart by buying the Cunha supermarket chain (Prezunic Comercial Ltda) at a price less than what Wal-Mart had offered, and hiking their total supermarket retail market share there to 4%, second only to Wal-Mart’s 10%. Cencosud’s toy market share in the countries in which they operate is thought to be around 15%. Ripley Corp SA is a Chilean-based retailer with a total of 54 stores in Chile and Peru. Sales in 2011 were US$ 612 million. 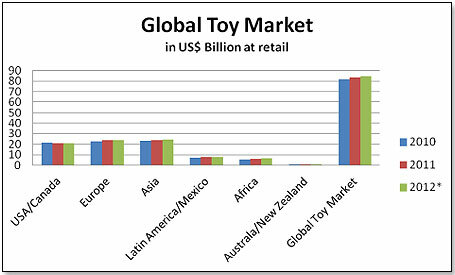 Market share in the toy space in the two countries is estimated at 5%. These multi-nationals cover the toy market in Latin America with market shares between them as high as 72% (Argentina) and as low as 40% (Brazil and Peru). As far as national toy chains are concerned, R I Happy stands out. It is a Brazilian chain with 114 stores and sales last year of about $400 million. It is thought to be the single largest toy retailer in the country. The Carlyle Group acquired 85% of them earlier this year. R I Happy’s estimated toy sales are in the neighborhood of US$ 400 million, which represents slightly more than 26% of the Brazilian toy market. Another major national chain is Soriana, a retail department store chain in Mexico with 558 stores that competes head on with Wal-Mart. Soriana had in 2011 total sales of $7.9 billion and a market share of 25%, versus Wal-Mart’s 51%. In terms of toys, Soriana is thought to have about 15% of the Mexican market. The remaining stores, and the totality in the countries not covered by these multi-nationals, is handled by national and multi-national distributors whose main function is in two areas – providing credit to the many tiny retailers and shipping inordinately small quantities. There are only two companies claiming coverage of a large swath of Latin America. 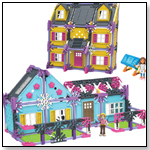 One is Distribuidora Kreisel, headquartered in Caracas, Venezuela, and covering toy retailers in Bolivia, Chile, Colombia, Ecuador and Central America in addition to Venezuela. The second one is Marcas Inteligentes owned by Hector Maggi (see third paragraph above) who covers Ecuador, Bolivia, Peru, Chile, Paraguay and Uruguay. The largest single-country distributor, in terms of sales, is Handell SAPI de CV, which covers Mexico only and has just been acquired by The Aureos Latin American Fund. 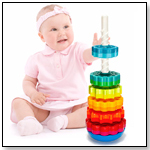 Handell has exclusive distribution rights in Mexico for Jakks, MGA, Giochi Preziosi, Playmates, Nikko and Meccano. Other than these, there is any number of distributors throughout Latin America. Just to name a few: CJX in Paraguay; Lomerco S.A. in Bolivia; Astro Toys, Giroflé Ltda and Gulliver in Brazil; FYF Toys and Ansaldo in Chile. Distributors’ charges vary depending on what they do. For a simple sales agent who does not warehouse or ship and who only collects orders, the margin would be anywhere from 2% to 10% on sales. For those that import, warehouse, ship and finance, the percentage rises steeply to a minimum of 25% on sales. In the specific case of Brazil, a product with a FOB China value of $1 would retail for about $2.80 to $3 as a function of freight, insurance, import duty, sales tax, VAT and distributor and retailer margins. Because of the Chile-US Free Trade Agreement, the same product would go there for only $2.15 to $2.25 at retail. Importation of toys into a Latin American country can be tricky, labor intensive and time consuming. In the case of Paraguay, you need 10 different sets of documents; in Mexico, a mere four. The average across Latin America is seven sets. Import procedures, once the goods have arrived at the Customs, can take an inordinate amount of time – Venezuela is the worst with 71 days, Panama is the best with 9 days, and the Latin American average is 22 days. Two import documents that are absolutely required are the Certificate of Origin and test reports showing the chemical analysis. Packaging can be either in the language of the country or multilingual (Spanish, Portuguese and/or English). 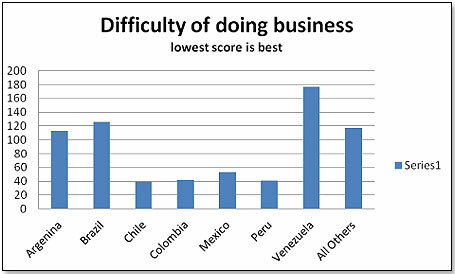 Overall, doing business in Latin America is not easy. There are major cultural differences between the United States and all of the Latin countries. A very good example is the fact that Wal-Mart failed to make the Prezunic acquisition in Brazil and lost out to Cencosud, even though they (Wal-Mart) offered more money. The reason for this surprising (to us) decision was that Horst Paul, Chairman of Cencosud, represented Cencosud throughout the entirety of the negotiations, whereas Wal-Mart kept on sending in batches of new people to hold the talks. The owners of Prezunic (the Cunhas family) saw the behavior of Wal-Mart as a sign of disrespect and a lack of consideration, and felt that money, after all, was not everything in life. A little like the Japanese, Latin Americans want to get to know and be comfortable with the negotiation partner, or their supplier, before they even start negotiating. These obstacles include excessive bureaucracy, the need to pay bribes to obtain permits, the absence of good technological infrastructure (e.g. telephones, internet access, good transportation options, etc. ), barriers to the importation of machinery or manufacturing supplies and archaic or inconsistent labor legislation. In this context it might be useful to remember that the United States is rated 4th in this metric and Germany 19. 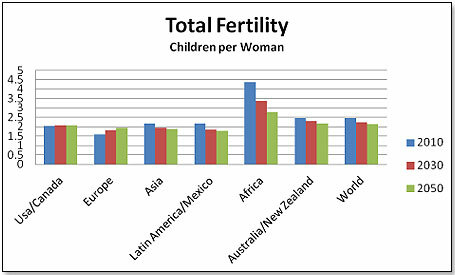 A fertility factor of 2.0 means that the population numbers remain constant. Anything below that tells us that the population is declining, and the only variable in this is immigration or emigration. 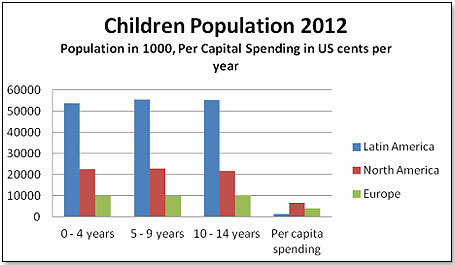 In the case of the U.S., where no organic growth is expected, immigration is expected to continue on a significant scale and will hence swell population numbers in the decades to come, which will result in more children and more toy sales. 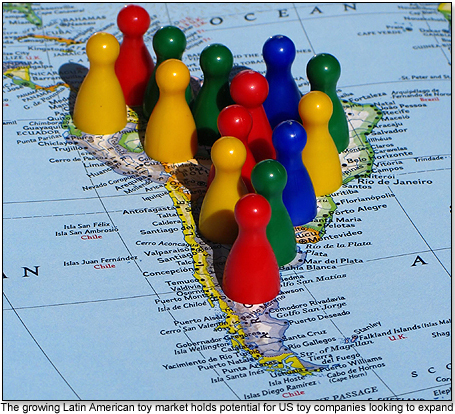 In summary, Latin American is today probably the best possible place for a small to middle-sized U.S. toy manufacturer to begin their international expansion. Firstly, the market is growing rapidly and is likely to continue doing so for years ahead. Secondly, there is any number of good partners available who can take the products and place them. Thirdly, assuming you pick these partners well, you will not be faced with credit issues or the need to navigate a very difficult bureaucracy.